When you get away from home you hope your new accommodations are up to par. Well, let me tell you our little home away from home was better than I thought it would be. Welcome to Tybee Isand and our cottage "Basking Under the Tybee Sun". Isn't it cute with the white picket fence? If it had been warmer we would have enjoyed this cute screened in porch. This is the table just inside the front door holding the extra keys and you can see the wifi box. They offer free wifi which was really nice. My mom realized that the table needed to be scooted over a bit, but I had already taken pics and put the camera up. Good eye, Mom. This is the cute living room area we hung out in at night after our long days out. 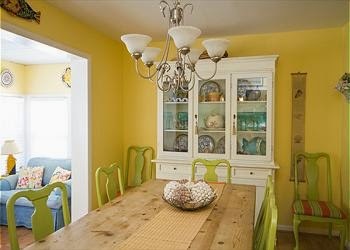 It is your typical coastal decor and it was colorful and comfy. I loved these bamboo chairs. Step down sun room off the dining area. I borrowed this shot from the website since I couldn't find the photo I took. At least I thought I did. The other side of the sun room. Nice kitchen and stocked with everything needed except food of course. There are stores close by for groceries. You can see I took this after I made our morning coffee. This is my cute bedroom and it was quite comfy. I slept really good. My bathroom was right next to my bedroom. This was my mom's room across the hall from me with an attached bathroom. You can visit my sister's blog to see her room. Not a good photo, but this is one of the cottages that has a tiny pool. The owners added it for there grand kids who visit when they all vacay together. This cute cottage's rentals are handled by Mermaid Cottages. They have several properties you can choose from to accommodate small or large families and some even allow pets. Ours did, but we didn't bring ours with us. The beach is a few blocks way so you can either walk or drive to it. 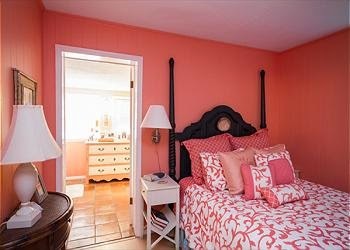 I highly recommend that you check out Mermaid Cottages if you want to visit Tybee Island where the cottages are located or if you plan a trip to Savannah. It is about a twenty minute drive to Savannah. Lots of great restaurants and shopping. Thank you, Mermaid Cottages for easy booking and a very comfortable stay. I'll be back with some photos from a few shops. Hope to see y'all tonight for Wow Us Wednesdays! Looks like a cute place to stay Kim. I follow them on IG. I bet you all had a great girls weekend. Ahhh this looks so nice right about now! We have had temps in the negatives the last couple days and a warm get-a-way would be pure bliss!! Checking out these rentals now! What a great place to stay. It looks so cute, love that picket fence. There's nothing like a getaway with your mom! Looks y'all had great accommodations! Love, love your blog! Such a pretty rental...love the way they have it decorated! Glad you all had a great time! Un petit séjour certainement magnifique ! Une petite maison semblable à une jolie bonbonnière. Oh Gosh I love Tybee Island! Such an adorable little cottage wish I could just move right in! It's adorable! I bet it was a lot of fun! It looks like the perfect little girls getaway place. looks like a sweet little place. glad you guys got a chance to get a way! Cute Cute Fun Fun!!! Love those kind of girls week ends. Glad you, Kelly and you sweet mom had a nice girls week end. The cottage is adorable. Tybee is so fun! The girls and I stayed in a condo there for a few days two years ago over spring break. We took the dogs and had a great time walking the around town -- they were welcome everywhere but the pier and the beach. Love the little cottages on the south end and the grand old houses on the north end. Such a cute, cute cottage...glad you had a great time in spite of the cold weather...Great to have a girls' getaway weekend in such a fabulous place! So cute! I dream of owning a cottage again someday. It's absolutely adorable, Kim, and really does look comfy, as well. I could easily live in this little castle! Great cottage! Tybee is so much fun. Hope you made it to Burton's By the Beach for their fish tacos - SO good! It's an adorable Cottage and it must have been so fun being there with your mom and sister! Cute cottage! Sorry it was so cold, but that seems to be the theme everywhere this winter! I saw Lelly's [ictures yesterday and loved seeing yours too. What a great cottage! It looks like it had everything you needed, too bad the weather didn't cooperate so you could use the screened porch!!! Your pictures turned out SO good! Mine were very fuzzy. That really was a great place to stay! Kim, you are in my favorite spot in the whole wide world! Tybee is so awesome! Love it's slowed down pace and total lack of commercialism ! So glad y'all are having some fun in the sun. Enjoy being on 'Tybee Time'! What a perfect cottage rental - that it has a dining room is such a bonus - and three bedrooms AND a pool! Glad you enjoyed your time here in Savannah! The weather was perfect, too! Looks like a perfectly comfy place to relax in! I've always wanted to go to Tybee Island. My son & his new wife went to Tybee for their honeymoon in the fall. What a beautiful cottage! I bet it was so relaxing too! Cute little cottage! I love Tybee Island. We used to vacation every year at Hilton Head Island and we always made a point to go to Savannah and sometimes over to Tybee too. One of my favorite areas in the US!! I have often wanted to travel to Tybee. What a nice idea to go with your mom and sister. The cottage was adorable...someday I hope to go!